Samsung today confirmed the new Galaxy A7 price and release date in India. The Galaxy A7 is Samsung’s first smartphone with three rear-facing cameras. India is one of the first markets to get this device. The new handset brings a premium design, a triple-camera system at back and promises of superior performance. Samsung says that it developed the Galaxy A7 based on consumer insight which shows that nearly half of Indian millennials use their smartphone cameras daily. They happen to use the rear camera twice as much as the front camera. The new Galaxy A7 has three rear-facing cameras. There’s the primary 24-megapixel sensor coupled with an 8-megapixel 120-degree Ultra Wide sensor. It also has a 5-megapixel depth sensor at the back. There’s a 24-megapixel front camera as well. With Pixel Binning, the device can detect low light conditions automatically and combine four pixels into one “Super Pixel.” This results in clear shots in the dark. The depth sensor enables Live Focus which lets users control the depth of field or bokeh effects during and after taking a photo. Samsung’s Scene Optimizer feature is present on this device as well. It can automatically detect up to 19 different scenarios such as food, sunset etc and then optimize each shot for the perfect picture. The AR Emoji feature is present as well but it’s the same watered down implementation as the Galaxy Note 8 and Galaxy S8. 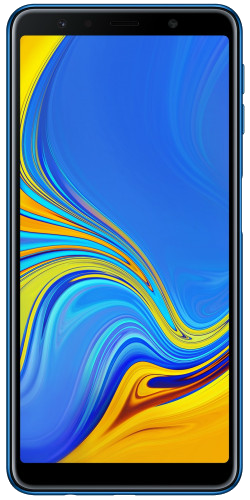 The Galaxy A7 features a 6-inch 1080×2220 pixel resolution AMOLED display. It’s powered by the Exynos 7885 processor with 4GB/6GB and 64GB/128GB RAM and storage variants. It supports microSD cards of up to 512GB. There’s a 3,300mAh battery, LTE Cat.6, Samsung Pay mini and Android 8.0 Oreo as well. Samsung is selling the Galaxy A7 in blue, black and gold colors. The 4GB/64GB variant is priced at INR 23,990 (~$330) and the 6GB/128GB costs INR 28,990 (~$400). Customers are eligible for a cash back worth INR 2,000 when they pay through HDFC bank credit and debit cards. It will be available for a special preview sale on Flipkart, Samsung e-shop and at the Samsung Opera House in Bengaluru on September 27 and September 28. The Galaxy A7 will also be available from the company’s countrywide retail network by the end of this month. @Sammobile Does this phone have Bixby voice too? I can’t see any dedicated key for that.